A blogging friend’s husband from down Carolina way, sent me a condensed version of a great undertaking by the folks in North Platte, Nebraska this past summer. I looked around as I often do and found this old article from the Wall Street Journal. All credit goes to Bob Greene, and the WSJ and, North Platte Telegraph for this content. Be you Red or Blue, here’s a feel-good story for you. 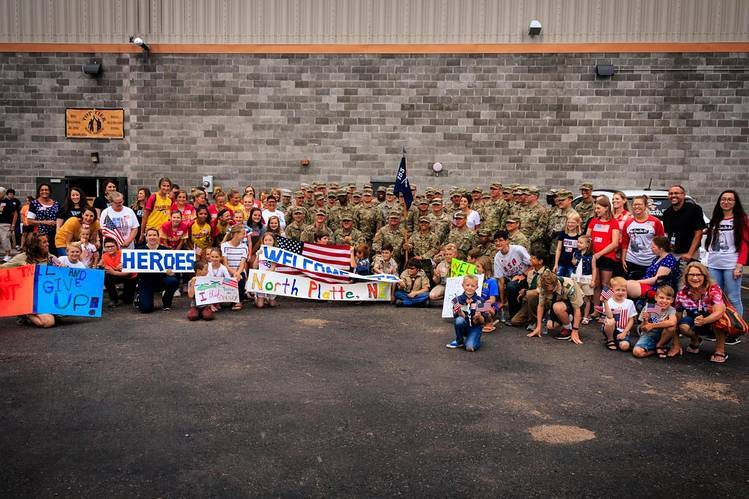 When service members pass through this small town in Nebraska, the community comes together to thank them. Col. Jaskolski, a veteran of the Iraq war, is commander of the 142nd Field Artillery Brigade of the Arkansas Army National Guard. For three weeks earlier this summer, the 142nd had been conducting an emergency deployment readiness exercise in Wyoming, training and sleeping outdoors, subsisting on field rations. Now it was time for the 700 soldiers to return to their base. A charter bus company had been hired for the 18-hour drive back to Arkansas. The Army had budgeted for a stop to get snacks. The bus company determined that the soldiers would reach North Platte, in western Nebraska, around the time they would likely be hungry. 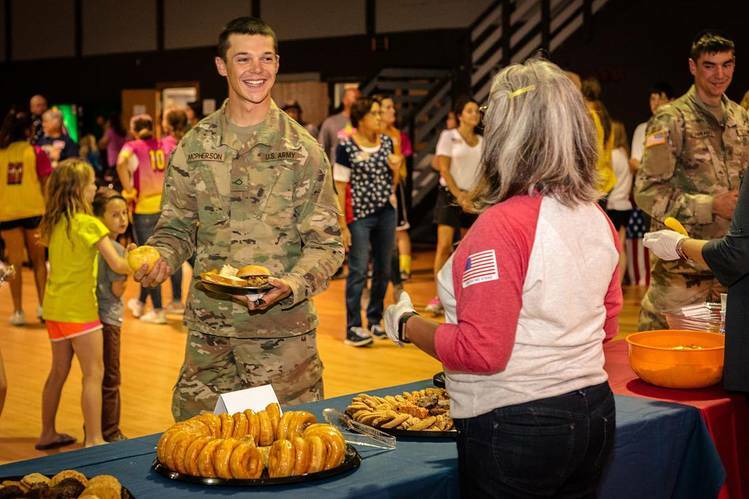 The company placed a call to the visitors’ bureau: Was there anywhere in town that could handle a succession of 21 buses, and get 700 soldiers in and out for a quick snack? North Platte said yes. North Platte has always said yes. During World War II, North Platte was a geographically isolated town of 12,000. Soldiers, sailors and aviators on their way to fight the war rode troop trains across the nation, bound for Europe via the East Coast or the Pacific via the West Coast. The Union Pacific Railroad trains that transported the soldiers always made 10-minute stops in North Platte to take on water. The townspeople made those 10 minutes count. Starting in December 1941, they met every train: up to 23 a day, beginning at 5 a.m. and ending after midnight. Those volunteers greeted between 3,000 and 5,000 soldiers a day. They presented them with sandwiches and gifts, played music for them, danced with them, baked birthday cakes for them. Every day of the year, every day of the war, they were there at the depot. They never missed a train, never missed a soldier. They fed six million soldiers by the end of the war. Not 1 cent of government money was asked for or spent, save for a $5 bill sent by President Franklin D. Roosevelt. The soldiers never forgot the kindness. Most of them, and most of the townspeople who greeted them, are dead. And now, in 2018, those 21 busloads from the 142nd Field Artillery were on their way, expecting to stop at some fast-food joint. “We couldn’t believe what we saw when we pulled up,” Col. Jaskolski said. As each bus arrived over a two-day period, the soldiers stepped out to be greeted by lines of cheering people holding signs of thanks. They weren’t at a fast-food restaurant: They were at North Platte’s events center, which had been opened and decorated especially for them. The soldiers entered the events center to the aroma of steaks grilling and the sound of recorded music: current songs by Luke Bryan, Justin Timberlake, Florida Georgia Line; World War II songs by Glenn Miller, the Andrews Sisters, Jimmy Dorsey. They were served steak sandwiches, ham sandwiches, turkey sandwiches, deviled eggs, salads and fruit; local church groups baked pies, brownies and cookies. 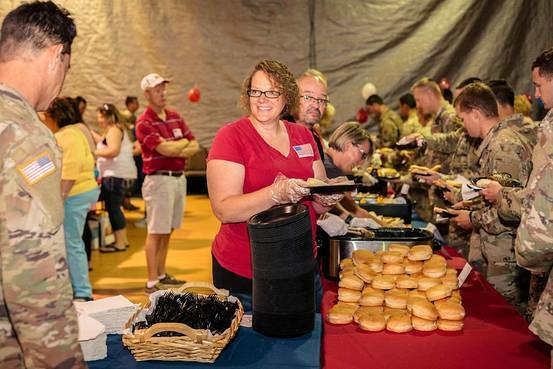 When it became time to settle up—the Army, after all, had that money budgeted for snacks—the 142nd Field Artillery was told: Nope. You’re not spending a penny here. This is on us. This is on North Platte. Don’t forget to check on the elderly. By elfidd / The Rooster in Sharing on February 11, 2019 . What a heart-warming story! John sent it to me, but there were no pictures. I read the story again and looked closely at the photos included here. I’m so glad you posted it. I absolutely love it when folks give me fodder for a Blog. Do we have a new auto? A Post from the past.